Singing and Spinning: The Littles do the Zoo. While one girl was skiing the other was playing with Grandpa and Grandma. According to Ivy the Giraffes were the best part. They had a wonderful time, and fortunately, the storm held out for them as well. We have multiple versions of this picture of Grandpa. 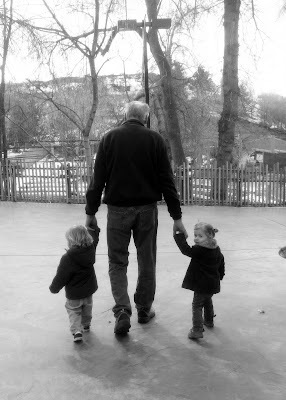 Some are with four grandkids, others are with two, and others are with more. But, this is the only one where one of them is worried that Grandma is not coming with them. 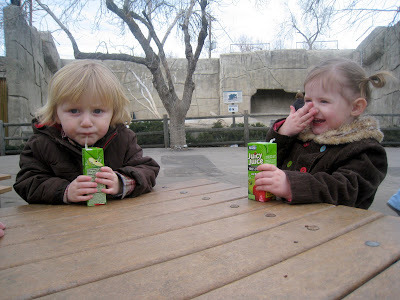 Drinking juice boxes is apparently a very entertaining thing to do at the zoo. Oh the characters of these two. Ivy likes to think that she is in charge of everything. 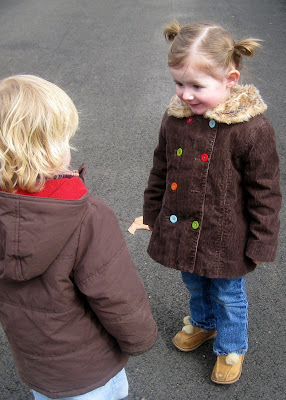 She scolded Harrison for jumping in the mud. Little Miss Bossy. I might have to find the "little miss" books that Kat and I had when we were little. It looks to me like one of them is telling a pretty interesting story. I'm sure it's about the elephant or the giraffe. Thanks Grandma and Grandpa for taking Ivy so that we could ski with Jade. 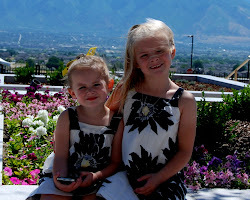 Both girls had a great day and neither felt left out.